May 8, 2013 May 13, 2014 Joanna V.
Last weekend, J and I took a roadtrip north to Monterey and San Francisco. You can see all of the photos here. The main destination on Saturday was the Monterey Bay Aquarium. Housed in an old cannery, the Aquarium is now home to a huge collection of California’s native marine species, from fish and turtles to sharks and sea otters, and even shorebirds. They research and resource sustainable seafood and rehabilitate and release injured wildlife from up and down the coast. The exhibit above is their Open Sea exhibit, during their scheduled feeding time. 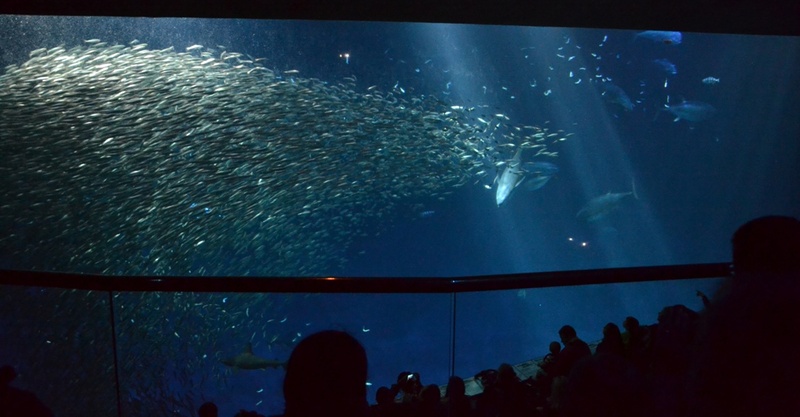 The swarm is a school of sardines, but there are also other large and small fish, sharks and sea turtles in the exhibit, as well as native invertebrates. The Aquarium began as a project to allow non-scuba-divers a chance to see what the Bay looks like beneath the surface. 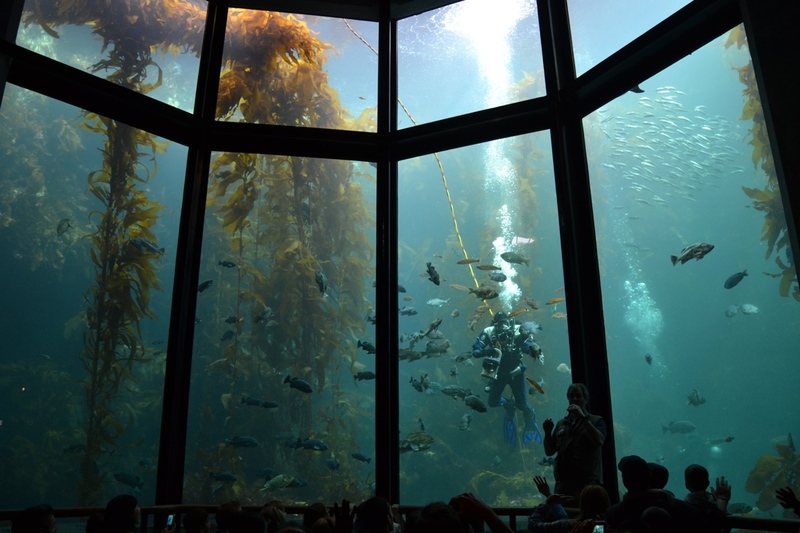 This Kelp Bed exhibit is modeled on the Bay; it contains live kelp and many species of fish, sharks and invertebrates that call the California coast home. We got to see a diver feeding some of the fish in this exhibit, too. One of the cool things about it is that the water in about 95% of the exhibits is actual bay water: they pump it and filter it and then cycle it back into the bay unaltered. This is a window into the ocean. J and I did a behind the scenes tour to learn about how the aquarium operates, and to see some of the exhibits a little closer. This is actually the top of the Kelp Bed exhibit. 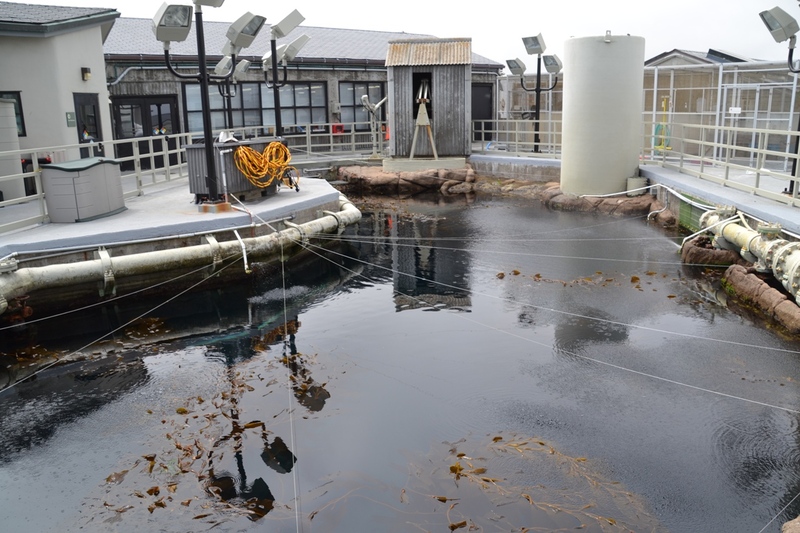 Tides and waves are recreated mechanically so the kelp stays healthy, and the strings keep birds from eating the exhibit fish. The buildings in the background are part of the sea otter rescue program, housing nurseries and surrogate moms for the pups; pups raised by otters do much better in the wild and learn to stay away from people. 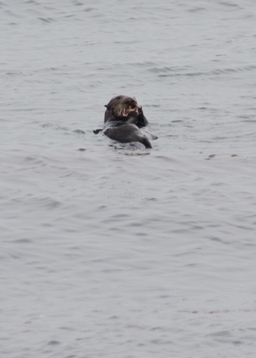 Speaking of otters, we saw a ton of them in the bay itself! They were hanging out in rafts, or drifting on their own, catching crabs and eating on their backs in the water. We even saw a mom and pup a little farther up the coast as we walked to Fisherman’s Wharf. 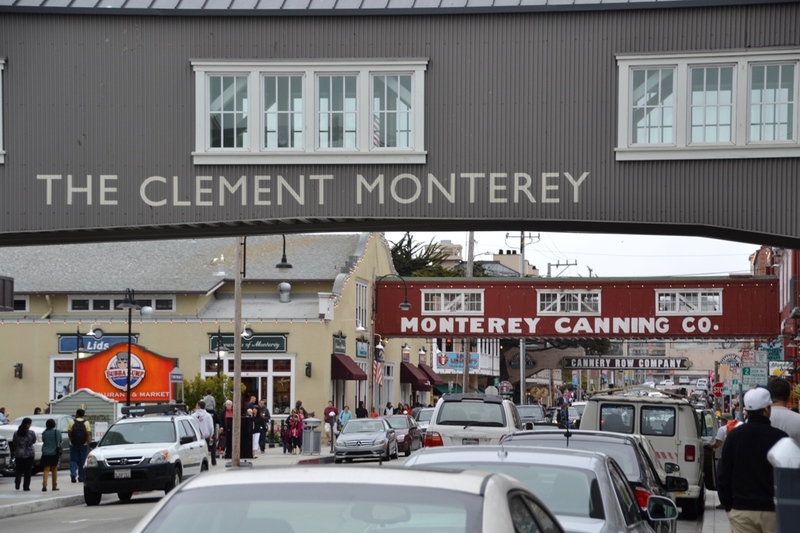 We walked down Cannery Row on the way to the Wharf, past all of the old canneries that have been turned into shops and restaurants. It’s interesting to see the old buildings, and to walk inside of them and see the skeletons of the industry. 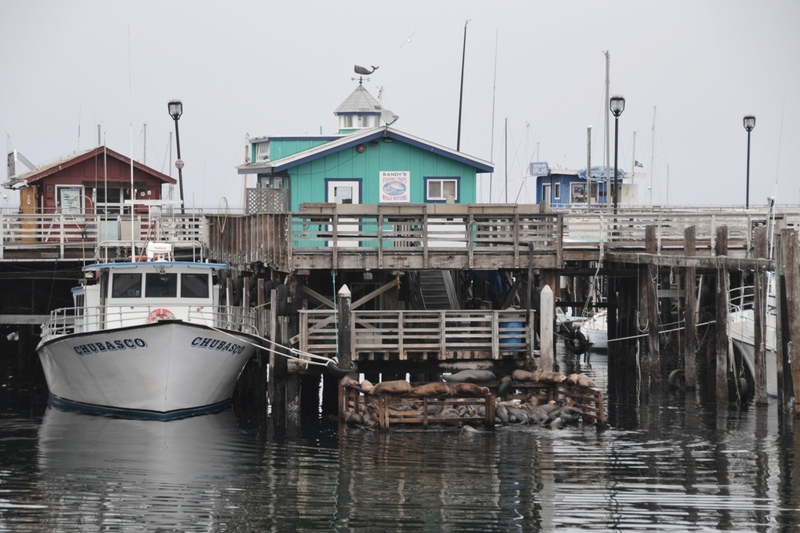 The Wharf had several offering whale watching and stands with samples of clam chowder in sourdough bread bowls. We also saw a pile of sea lions on one of the floating docks. We ended the day with a dinner at the Fishwife restaurant on the recommendation of a friend. It was a really fun day and I learned a lot about local California (coastal) wildlife, plus ate some amazing clam chowder and then fish for dinner. I’d definitely go to Monterey again.